A cultivar of Dendranthema x grandiflorum Kitam. Incurving ranunculus flowered. ‘Of tall stature, and one of the very latest in blooming; but very handsome, and repaying by its beauty every care bestowed upon it by the gardener. It has been called the most beautiful of all; but with me it yields to the gold-bordered Red.’ [FC p.73/1833]. 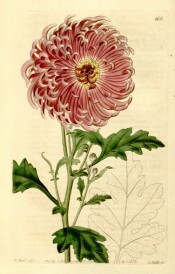 ‘Introduced by the Horticultural Society in August 1819, and flowered in the garden the following year. One of the latest importations from China, and in regard to the blossom, certainly one of the finest; but flowers produced late in the year and rather sparingly.’ [BR f.616/1822]. Listed in the 1845, 1850 and 1857 catalogues [H.68/1845].